Saint Camillus de Lellis was born in 1550 in the Abruzzi region of Italy. He grew to be 6'6" tall and of large stature. When old enough, Camillus went to fight with the Venetians against the Turks. However, he was struck with an ailment that would persist with him the rest of his days. He was sent to the San Giancomo hospital of the incurables in Rome, but was later discharged for his quarrelsomeness, and returned to fighting. St. Camillus always referred to himself as a great sinner, but in fact his only vice seem to be gambling. He gambled away everything he had after returning to the fight, and remembering his vow to join the Franciscans in a fit of remorse, he went to work as a labourer on the new Capuchin buildings in Manfredonia. Here, after a moving exhortation from the Friar, he completed his conversion and begged God for mercy, at the age of twenty-five. Camillus sought to join the Capuchins, but the leg ailment precluded entry into that order, so he returned to the hospital of San Giancomo as a servant. Repulsed by the slack character of the attendants, he sought to reform the hospitals staff by finding people of character wishing to serve in charity. This was met with much resistance, but he also resolved with the help of his confessor, St. Phillip Neri, to receive Holy Orders, in order to more completely help the sick. He was raised to Holy Orders, being ordained by Thomas Goldwell, the last bishop of the exiled English hierarchy. He severed ties with San Giancomo, against the advice of St. Phillip Neri, and formed what would be the Ministers of the Sick. The next twenty years would see great expansion of the Congregation, with 15 houses of priests and brothers, and also 8 hospitals being erected. Two major houses were established, and he oversaw the Congregations involvement in helping the sick on quarantined galleys in the harbor of Naples, from which several of his ministers died, becoming the first martyrs of charity. Also accomplished was involvement in the wars in Croatia and Hungary, giving rise to the first military field ambulance. In 1591 Gregory XIV at last promoted the Congregation to an Order. 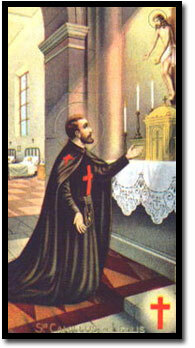 St. Camillus laid down control of the Order in 1607, but assisted in the first general chapter of 1613, and afterwards visited each house for final exhortations. His lifetime of maladies: the leg ailment, two sores to one foot causing great pain, a rupture for 38 years, and for some time a distaste of food that greatly reduced his stature and strength all combined to wear out the saints body, as he passed on July 14, 1614. For his pain though, he received gifts of miracles, healing and prophecies. Saint Camillus de Lellis, with St. John-of-God, are the Patron Saints of the sick, and he is also the patron of nurses and nursing associations. This was compiled from catholic-pages.com.